No matter how good the first tree we’d find may be, we always had to spend a good chunk of time looking through all of the trees available before selecting that “perfect” one. My in-laws were partial to the Fraser Firs, which tend to have more distinct branches and a light to medium green hue. My mother-in-law would wrap the lights around each and every branch! My brother-in-law’s family loved the Concolor Firs, a full, long-needled medium-dark green tree with a citrus aroma. My husband David and I like variety, so we’ve had Concolors, Frasers and Douglas Fir’s (a traditional dark green tree). Wolff’s has a beautiful supply of all of these varieties and many more ready to go for this Black Friday. Plus, don’t forget to pick up a copy of their Christmas tree preserving tips. This year, however, as we find ourselves living in the French Alps where they don’t sell fresh cut Christmas trees, we’re probably just going to have to get an artificial tree from Ikea. One time, though, while on a hike we came across the most amazing coniferous tree I’ve ever found (pictured above). It looked like just like any other evergreen, but when we brushed by it, we couldn’t help but tell how soft it was – it felt like petting a Golden Retriever! We’ve since tried to find others of that variety to no avail. So you can rest assured that we did not cut down an alpine forest tree – not yet, at least. To carry on the traditions of making recipes out of Thanksgiving leftovers this year, I’ll be making a turkey pumpkin chili this weekend for the international college students we work among. Turkey shreds apart easily, so this recipe can be made with either cooked turkey or by browning raw turkey (either ground or finely chopped turkey breast). 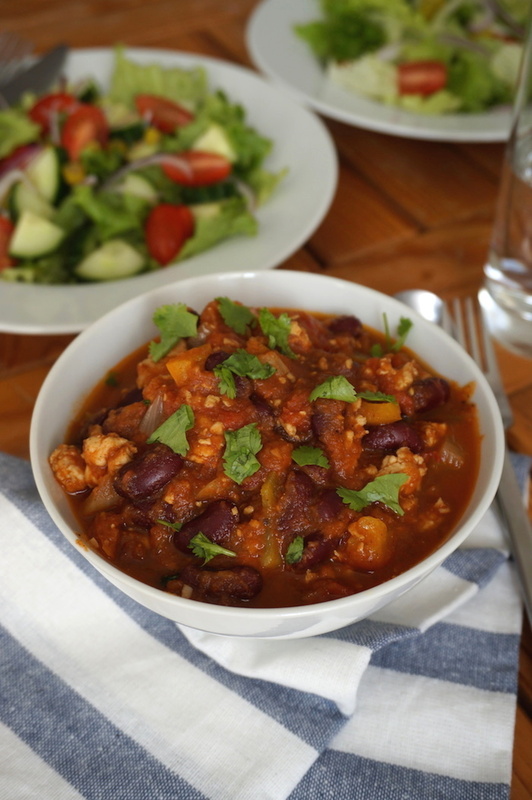 So as you plan your Thanksgiving feast, why not grab a few extra ingredients to make this chili with your turkey leftovers?